If this is not your first SuppVersity article, you may have read about the potential negative effects of (high dose) anti-oxidant supplementation in previous SuppVersity articles about, or touching on the effects of hormesis, i.e. 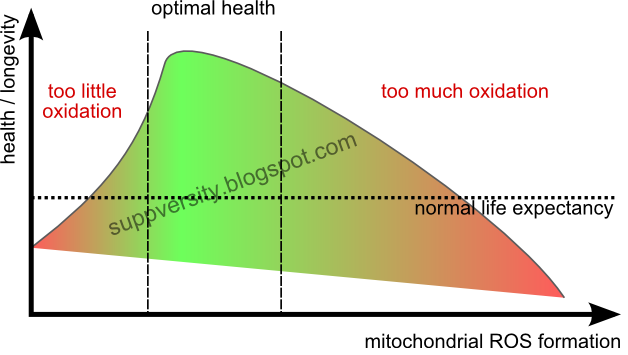 the beneficial effects of "good oxidative stress". Up to now I have yet often said that it is possible that this effect occurs mostly in people who can handle stress pretty well and thus have to hammer it to trigger a measurable adaptive response. 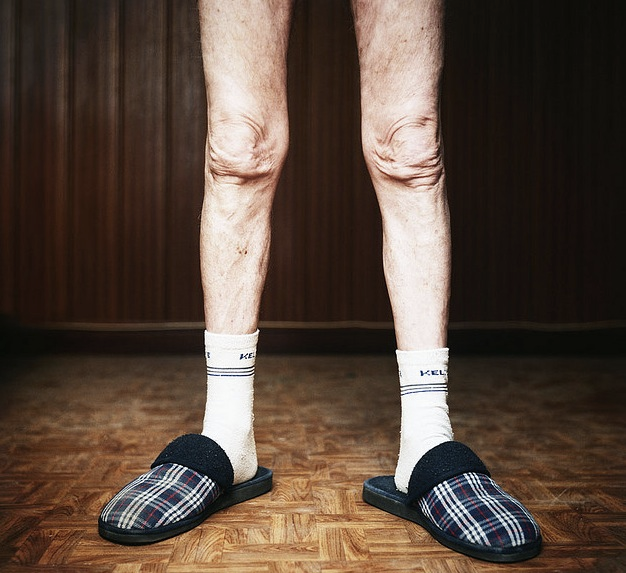 The elderly subjects in the latest study from the University of Agder in Norway (Bjornson. 2015), however, don't exactly belong to the group of people I was thinking about, when I phrased this hypothesis. 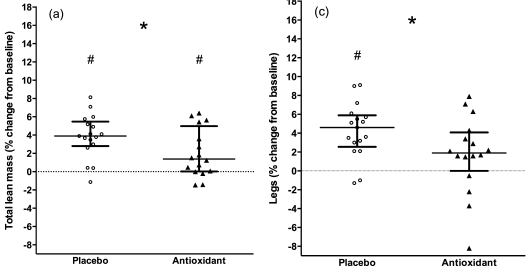 In said study, thirty-four elderly males (60–81 years) were randomized to either an antioxidant group (500 mg of vitamin C and 117.5 mg vitamin E before and after training) or a placebo group. Needless to say that both groups adhered to the same standardized strength training program. The number of sets per exercise was increased progressively from 1 to 4 sets during the first 10 weeks, and then reduced with one set each of the last 2 weeks of the intervention (tapering). Will the same mess happen with curcumin? I get this question whenever I am writing articles about hormesis and I still cannot answer it. I believe it is less likely than with vitmamin C, E and NAC, for which it has already been shown that they impair your gains (read the full story on NAC), because curcumin, green tea and co are not only targeting the free radicals, but also the inflammatory processes that occur in response. This does not mean that it is not possible that even these supplements are diminishing your gains, though. It just appears less likely. Update: In fact, the ill effects of NAC specifically have - as you may have read in the 12+ Facebook news I post per day - been confirmed recently, a study that showed a 5.9% (p<0.05) reduction in insulin sensitivity compared to a non-supplemented control group (Trewin. 2015). The participants conducted one additional “warm-up” set at 50% of their target weight in each exercise before the main sets started. The last set of each exercise was performed with maximal number of repetition, and if the number of repetitions exceeded the sessions target repetitions, the load was adjusted for the next week’s sessions. Two experienced instructors supervised all strength training sessions and the loads were weekly adjusted" (Bjornson. 2015 | my emphases). At he end of the 12-week study, the changes body composition was assessed with dual-energy X-ray absorptiometry, the subjects' muscle thickness was diagnosed by ultrasound imaging and the muscle strength was measured as one-repetition maxima and the results were quite unambigous. Figure 1: Changes in muscle thickness. Percent changes in muscle thickness after 4 weeks, 8 weeks, and post-exercise in the placebo group (●) and the antioxidant group (▲), measured in three locations; m. rectus femoris (a), m. vastus lateralis (b) and armflexors (c).Data presented as median with 95% confidence intervals (Bjornson. 2015). While the total lean mass increased by 3.9% (95% confidence intervals: 3.0, 5.2) in the unsupplemented group, the provision of only 500mg Vit C and 117.5mg vitamin E which is actually what some special "sports mulitvitamins alone have) decreased the mass gains by 64% (total lean mass gain was only 1.4% for the antioxidant group. What about people with inflammatory diseases? I guess different rules apply for different people. Assuming you have a high baseline inflammation it may be wise to do everything to lower it to make the "good" inflammation "heard" - think of it as the guy on a ship who screams whenever people have to row to synchronize the rowing. You mess up if you shut him up, but what's even worse is if 100 people are trying to do his job. Several studies show that in the obese, for example, anti-oxidants will not trigger weight loss, but facilitate it - in lean, non-inflamed people, on the other hand, they won't. Ok, that's a different domain, but the same principle. After all the inflammation is relevant for a healthy metabolism, as well | learn more. That's a difference that reached statistical significance and despite some outliers on both sides of the "divide" and mustn't be ignored as random (P = 0.04). Figure 2: There are differences on the individiual level, but for the total muscle mass and the largest muscle group (the legs), there's little doubt that (a) the gains of the majority of subjects was reduced (Bjornson. 2015). Similarly, the thickness of m. rectus femoris increased more in the placebo group [16.2% (12.8, 24.1)] than in the antioxidant group [10.9% (9.8, 13.5); P = 0.01]. This leaves us with the lean mass in trunk and arms, and muscle thickness of elbow flexors groups and the 1RM which improved in the range of 15–21% (P < 0.001), but didn't differ between groups. 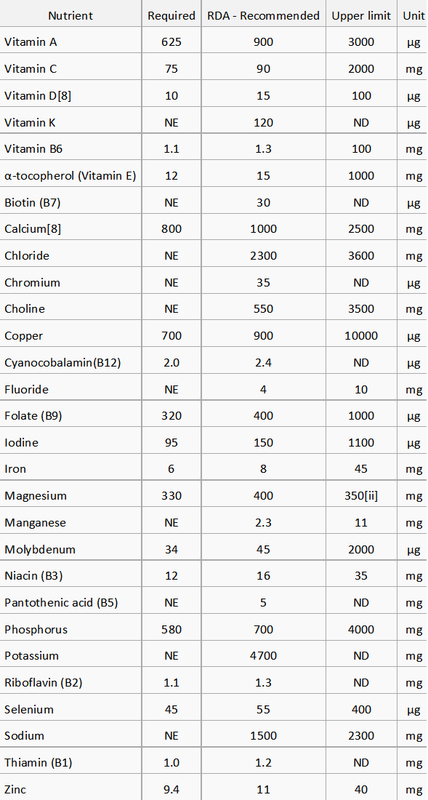 Minimal, recommended and maximal intakes for all vitamins and minerals (Wikipedia. 2015). So what? The study at hand complements evidence from studies in younger individuals, where the beneficial health effects (Ristow. 2009), the anabolic signalling, but not the 10-week gains were reduced (Paulson. 2014a, b) and confirms that "high" dosage vitamin C and E supplementation blunts certain muscular adaptations to strength training in man. In that, the dosages are too high to be derived solely from foods (ok, I admit you can get that much from food, but no one really does). Therefore, the common recommendation to eat more fruits and vegetables is not affected by the scientists's observation. You should still eat more of these healthy foods. What you shouldn't fall for, though, is the bogus false promise that suffocating all the flames by using exorbitant amounts of vitamin C and E (aside from NAC, those appear the only antioxidants w/ sign. anti-gains effects) would be good for you, let alone your training progress and muscle gains. 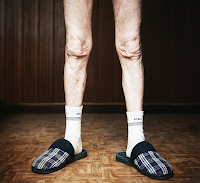 Even though, some subjects in the placebo group, have almost identical gains, the number of those who didn't gain anything or even lost lean mass is so much higher that and the number of subjects that benefited (ZERO) so much lower that you cannot recommend extra-vitamins for people who work out - specifically not the elderly | Comment! Bjornson et al. "Vitamin C and E supplementation blunts increases in total lean body mass in elderly men after strength training." Scandinavian Journal of Medicine & Science in Sports (2015): Early view article. Paulsen, Gøran, et al. "Can supplementation with vitamin C and E alter physiological adaptations to strength training?." BMC sports science, medicine and rehabilitation 6.1 (2014): 28. Paulsen, G., et al. "Vitamin C and E supplementation alters protein signalling after a strength training session, but not muscle growth during 10 weeks of training." The Journal of physiology 592.24 (2014b): 5391-5408. Ristow, Michael, et al. "Antioxidants prevent health-promoting effects of physical exercise in humans." Proceedings of the National Academy of Sciences 106.21 (2009): 8665-8670. Trewin, Adam James, et al. "Effect of N-acetylcysteine infusion on exercise induced modulation of insulin sensitivity, and signaling pathways in human skeletal muscle." 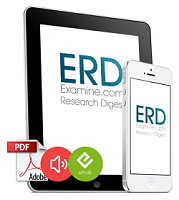 American Journal of Physiology-Endocrinology and Metabolism (2015): ajpendo-00605. Wikipedia contributors. 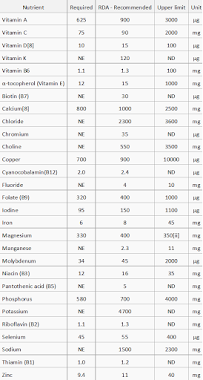 "Dietary Reference Intake." Wikipedia, The Free Encyclopedia. Wikipedia, The Free Encyclopedia, 23 May. 2015. Web. 2 Jul. 2015.